Open year-round, Scenic Mountain RV Park and Campground is a 112-acre gem hidden in the hills south of downtown Milledgeville, Georgia. Located about 100 miles southeast of Atlanta, just off Highway 441, this park is a peach! Since 2013, Scenic Mountain RV Park and Campground has been owned and operated by Detmer Shaffer, a seasoned RV traveler turned resort owner. Scenic Mountain offers 72 sites, full hookups, and paved roads throughout. The comfortable pet-friendly park features plenty of wildlife, six fishing ponds, hiking trails, a swimming pool, bathhouse, clubhouse, and coin-op laundry, among other amenities. About a dozen miles from Scenic Mountain RV Park and Campground is the popular municipal Lake Jonesco Golf Course, which opened for play in 1936. The par 72, 18-hole public course stretches to 6,544 yards and is open all year. It offers three tee boxes to accommodate different skill levels. There’s also an in-house professional on staff, a driving range, along with club and cart rentals. Another golf option in the area is The Club at Lake Sinclair. The private course opened for play in 1957 and recently expanded its golf options for non-members, for a limited time anyway. The well-manicured par 72, 18-hole course measures a short 6,262-yards. 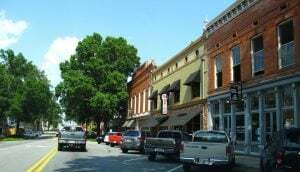 Visitors will find the nearby town of Milledgeville teeming with history and plenty to see and do. The city that served as Georgia’s capital during the Civil War, Milledgeville offers tours of the Old Governor’s Mansion and the spectacular Old Capital Building. Other highlights of the area include Andalusia Farm—Home of Flannery O’Connor, the 1,300+ acre Bartram Forest, and a guided tour of the town on the Historic Trolley Tour. A visit to Milledgeville’s Main Street is a must. The dining and shopping options are plentiful, and the scenery is just plain pretty! More details about this historic town in Georgia can be found at Milledgeville; Capitals, Columns & Culture. You can also read more about Scenic Mountain RV Park and Campground on Campground Reviews.